A common problem while developing apps is that you end up with over-complicated classes containing View logic as well as business logic. Both are so intertwined that it’s impossible to test them independently. Code-readability suffers and future code changes are hard to implement. Since there are almost no constraints to your architecture in Flutter, it’s fairly easy to run into this problem. Some developers write all of their code in the Widget until they realize the mess they produced. Reusing code in other Projects seems impossible and in the end, you write most of your code twice. MVVM tries to solve that by splitting up business logic and view details. In this article, we show you how MVVM with Flutter could look like. We’ll create a functional reactive ViewModel using Darts Stream API. 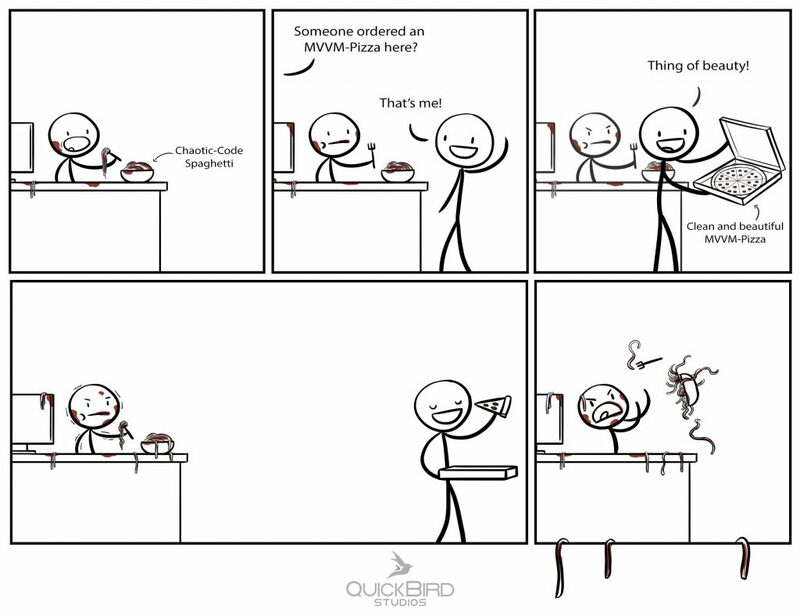 Before we look at any code, we should get a basic understanding of MVVM (Model-View-ViewModel). If you’re familiar with MVVM you can skip this part. The main goal behind MVVM is to move as much of the state and logic from the View into a separate entity called the ViewModel. The ViewModel also contains the business logic and serves as the mediator between the View and the Model. In Flutter, the Widget represents the View of MVVM. The business logic sits in a separate ViewModel-class. The ViewModel is totally platform-independent. It contains no dependencies to Flutter and can, therefore, be easily reused e.g. in a web project. That is one of MVVM’s biggest powers. We can create a Mobile App and a website that both share the same ViewModel. You don’t need to reinvent and write the logic twice. As explained above, the ViewModel has Input and Output parameters. We will add an ‚input‘ or ‚output‘ prefix for the sake of clarity. All Inputs are Sinks. The View can use those to insert data into the ViewModel. We are using a StreamController as an input Sink. This StreamController provides a stream that we can use internally to handle those input events. So how to supply inputs and handle output events? To supply input values to the ViewModel we insert them into the ViewModel’s Sinks. We’ll bind a Widget to the ViewModel. In this case, we insert the TextField’s text whenever it changes. You listen to the ViewModel Outputs by subscribing to the Output-Streams. Flutter provides a really cool Widget called StreamBuilder that will update whenever a Stream provides a new value. We won’t call „setState“ ever again! The StreamBuilder‘s “builder” method gives you a snapshot whenever it builds. This snapshot contains information about the stream, its data, and its errors. If our stream did not emit any value, “snapshot.data” will be null. So, be careful. QUICK TIP: Try to help the Dart compiler when working with streams, add all the needed generic types to avoid runtime errors. As you can see, the View’s only responsibility is rendering Outputs and supplying Inputs to the ViewModel. Our Widget is therefore super slim and easy-to-read. We started out with MVVM in the native world and wondered if it would also work with Flutter. After trying it out, we can say: MVVM is a great fit for Flutter as well. We love it how nicely the View-logic is separated from the business logic, how easy ViewModels can be unit-tested, and how seemingly Dart ViewModels can be shared with other platforms that are using Dart. The Stream-API takes some time to get used to but afterward, it feels very smooth. For more complicated tasks we used RxDart which adds functionality to the standard Stream-API. If you’re just hacking a small app, then the normal “put-everything-in-one-class” approach might be more straightforward. If you plan to build a bigger app though, MVVM might be the architecture for you.